The AMT S15i Side Clamping Microphone System for Guitars includes the S15 External Microphone and an Inline Preamp. The system is intended to clamp onto the side of a guitar allowing for quick and easy removal during traveling or when the microphone is no longer needed. The S15i is suitable for top professionals looking for a natural sound reproduction possible from a clip-on microphone. It features D.C.T. (Disconnect Cable Technology) and the ability to connect the Wi5IIC creating a belt pack free wireless system. This is an electret-condenser microphone that has been specifically designed for the cello, keeping in mind sonic characteristics and parameters of string instruments, such as the ability to get the most gain before feedback. The S15i uses a very tight pattern to give a high rejection to surrounding noise, at the same time reproducing accurately the subtleties of the guitar. 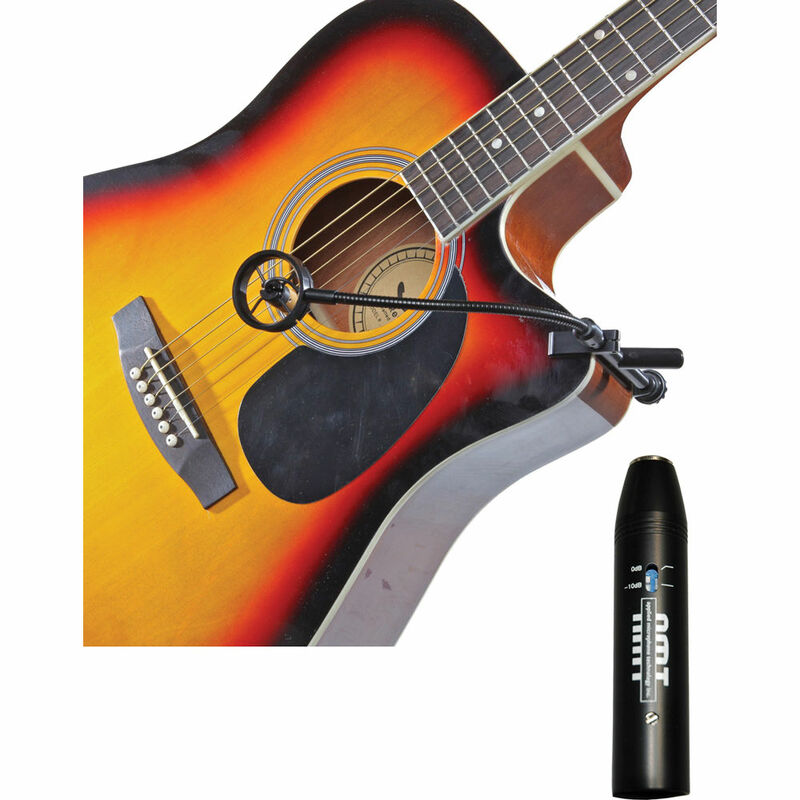 As placement is especially important with an instrument that has a fine finish and varying dimensions, this microphone's attachment mechanism is designed to secure the mic to the guitar in different positions taking seconds to attach. The attachment mechanism is fitted with natural soft suede so as not to mark or mar the instrument. Manufactured with lightweight aluminum to keep the mass low yet extremely strong, this microphone will remain durable through many years of use. The flex arm is easy to position yet retains it's placement throughout the most active of performances. The system includes an Inline Preamp, for which phantom power is required for operation. The output is terminated with a single male XLR type connector for balanced use. The mic is connected to the pre-amp by a 4-pin locking connector. The S15i comes complete with an Inline preamp, a carry pouch, and AMT's Disconnecting Cable Technology that allows the microphone to be used wireless with the AMT Wi5IIC, Shure Line 6, or Sabine Wireless. The Sennheiser cable is sold separately.